Saw another dumb gift idea, a DNA test. In my old neighborhood, Father’s Day was the result of a DNA test, not the reason to present one as a gift! Here are some photo gifts that are perfect for Dad’s Day. Could work well for June Grads, too. From my favorite pen store this side of Japan, the Tool Pencil from Monteverde is a combination lead pencil – stylus – screwdriver – ruler. It comes in your choice of six colors and costs $35. If you’re wondering how this is photo-related, here’s the answer: include it in close-up pictures when recording subject size is critical. Include in macro shots to show scale. It’s ideal for sportsman, too. Since it measures 5.9-inches, the ruler is perfect for measuring any fish I’ll ever catch. According to JetPen’s website, it has a “…weighty metal body with a hexagonal shape that is comfortable to hold and keeps the pencil from rolling away.” Rolling pencils have been a problem for me since kindergarten. Here’s a useful—and affordable—accessory that can be used year-round. Since reviewing it in 2016 I’ve found myself using it more and more to create high quality shooting situations for all sorts of things—from food to camera gear to anything smaller than a breadbox. In a nutshell, the Studio-in-a-Box is a durable fold-together cube that has silver reflector walls on the inside and an array of very bright LEDs embedded in the top. It comes with white, black, blue and murky tan sweeps so you can shoot shadow-free, background-free images. Color temp is roughly daylight and the LEDs are strong enough that you can shoot handheld at a low ISO and high shutter speed. Prices start at $69 (for 16x16 inches) and range to $119 for the largest size, 28x28. I use the 24x24 which sells for $99. There’s also a 20x20 that’s $79. For more info, check out my earlier review of the Fotodiox LED Studio-in-a-Box. PS: don’t go sticking your head inside with your eyes wide open. When I say the LEDs are bright, I mean you’ll singe your eyelashes if you’re not careful. Measuring just 12.2 x 7.5 x 4.3 inches and weighing a scant 1.2-pounds, the handsome Sling 5L holds a DSLR (or mirrorless) and a couple lenses, small tablet (up to about 9.4 x 7.3 inches) plus small accessories. Like all Peak Design products, the Everyday Sling is a remarkable combination of innovative engineering and meticulous construction. It was designed to be the ideal ultralight bag for transporting, organizing, and protecting DJI Mavic and Spark drone kits, mirrorless kits, or the aforementioned digital camera outfits. Available in two colors (black and grey) the Sling 5L can be worn as a cross-body sling or waist bag and sells for $99. Also check out Peak Design’s Everyday Photo Backpacks which we reviewed here a couple years back. While I really dig the Think Tank Modular Belt System that I wrote about a few weeks back, I’ve found a belt rig that might be even more useful for some. It’s called the Six Pack Beer Belt and it’s available in the UK from an outfit called Prezzy Box. It’s unclear whether or not they ship to other countries. This accessory is just what the doctor ordered because it allows you to carry the beer near where it’s going to end up eventually—that is, on your waistline. 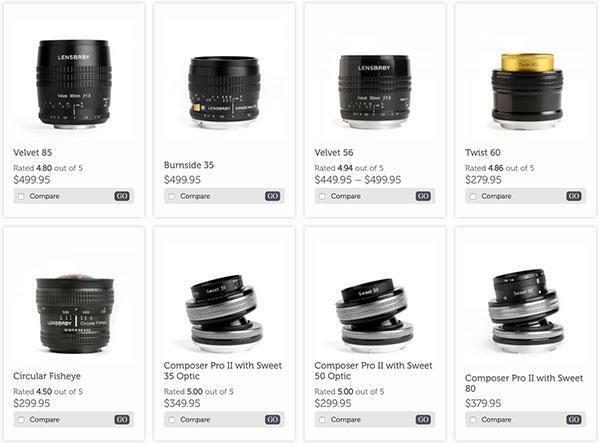 Today Lensbaby has grown to offer dozens of optical products across several categories, including lenses for mobile phones. And they are all still magnificently unsharp. To find out which Lensbaby is best for your Father this Father’s Day, take a long look at Lensbaby University. Now that I’ve had a chance to use it I understand how it could be a lifesaver in an emergency. Not to mention that it replaces several other rough tools. $50 from Amazon and other sellers. Read recently that someone introduced a “photographer’s jacket” based on the military issue M65. To me that’s like inventing an oral hygiene device based on the toothbrush. Doesn’t it make more sense to adopt the original rather than try to adapt the design? Okay—June is the wrong season for a Field Jacket, but fall follows summer and two days later it’s winter—and colder than hell. You can easily find army-issued surplus M65s online, or you can order a Propper coat from a place like BDU.com. Propper is a supplier to the government and producer of high quality products. A classic M65 with removable lining will cost in the neighborhood of $77 from BDU, give or take. Such a deal. Watch your step because many sellers offer M65s for around the same price without the button-out lining. Thank you for featuring the most interesting ideas for fathers, graduates and myself. I love the trucker's friend and the monteverde pencil. All of the possible gift choices were practical and affordable! Good reading as always. Perhaps I could fill the six pack beer belt with diet cokes!